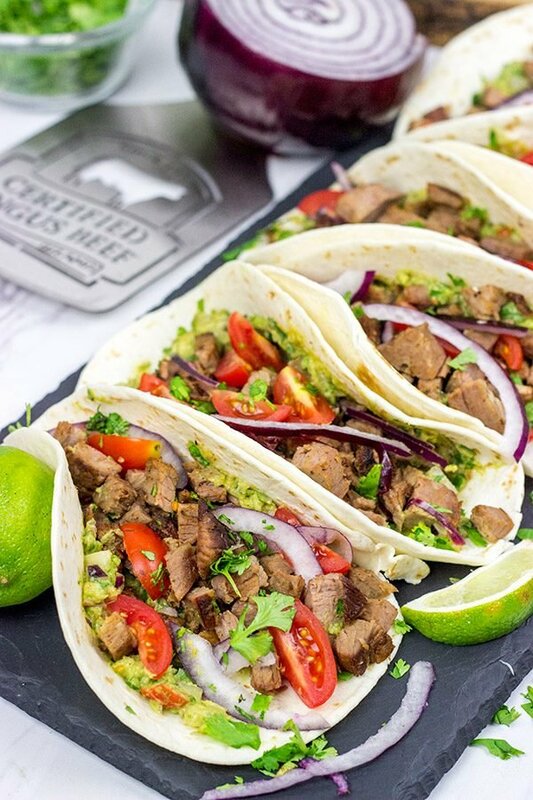 This​ Smoked Brisket Tacos ​post​ ​is​ ​sponsored​ ​by​ ​the​ ​Certified​ ​Angus​ ​Beef​ ​®​ ​brand​ ​in​ ​conjunction with​ ​a​ ​social​ ​media​ ​campaign​ ​through​ ​Sunday​ ​Supper​ ​LLC.​ ​All​ ​opinions​ ​are my​ ​own. 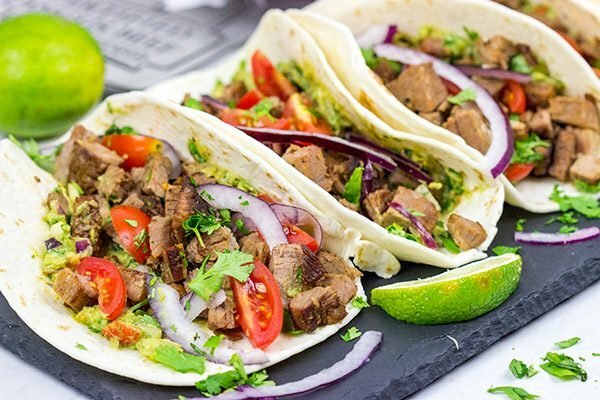 Smoked Brisket Tacos are one of the best things about summer! 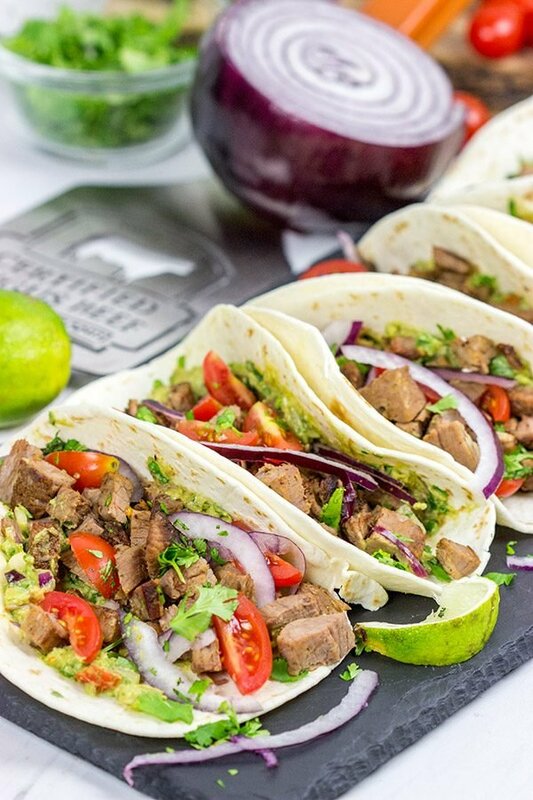 Learn some brisket-smoking tricks, and grab the recipe for these tasty tacos! There’s nothing I’d rather be doing at 7am on a Saturday morning in the summer than prepping my smoker. Ok, that might be a small lie as 7am on the weekend is still rather early to be awake. But Robbie often gets up early on weekends, so if I’m going to be awake then I might as well be prepping the smoker! Today’s post is about one of my all-time favorite smoker recipes: Smoked Brisket. Laura got me a smoker for my birthday the year we moved up here to upstate New York, and I immediately set about learning how to smoke all sorts of different foods. Over the years, I’ve made smoked salmon, smoked sweet potatoes, pulled pork and a pizza that only tasted like smoke (oops). But one of the recipes that I go back to again and again is smoked brisket. In fact, when the weather starts to turn chilly every Fall, I’ll typically smoke a couple of briskets and then store them in the freezer for easy winter meals. Looking out at snow that never seems to melt gets old in the winter, but having smoked brisket sandwiches for dinner provides some mental warmth at least! But it’s summer now. None of that snow and winter talk! Let’s turn our attention to how to properly smoke a darned good brisket. Smoking a delicious brisket starts with purchasing good quality meat. That’s no surprise, right? 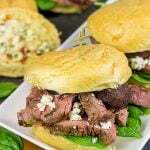 We rely on Certified Angus Beef ® brand for all of our beef, and we’ve got a great local butcher store here in town that I’ll swing by whenever we need premium cuts of beef. I stopped by Fred the Butcher a couple of weeks ago and picked up this brisket. 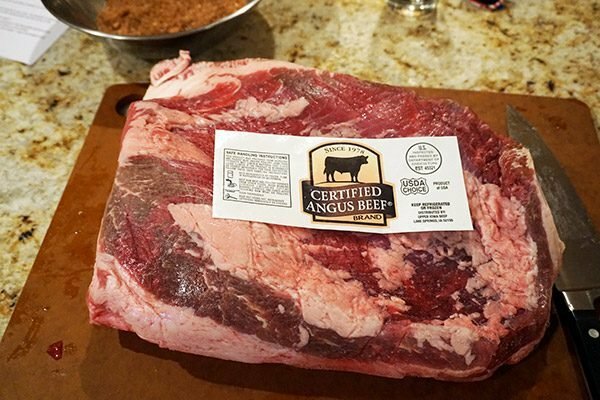 Certified Angus Beef® brand doesn’t actually raise cattle. Instead, the company was established by leading researchers and academics, and they rely on 10 quality standards when selecting the best of the best beef from farmers across the country. In fact, only 1 in 4 Angus cattle meet the Certified Angus Beef® brand’s quality standards. 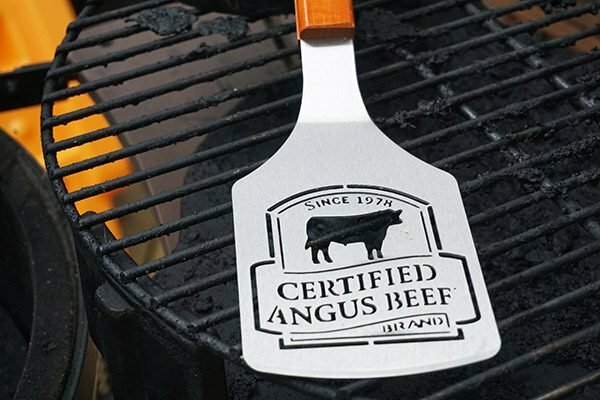 Whenever you see the Certified Angus Beef® brand logo, you know you can count on excellent quality beef. I actually keep an eye on sales at our local stores, and I stock up whenever we start running low. In the summer, our freezer is packed with steaks and ground beef. In the winter, you’ll find roasts and tenderloins. But it’s always Certified Angus Beef® brand. Quality beef – check! Next step: a good rub. I was down in Philadelphia a couple of months ago for my last curling tournament of the season, and I got to talking with a guy from an opposing team about smoking brisket. Turns out he loves his smoker about as much as I do, and we started talking about what sort of rub I put on my brisket. I rattled off the usual suspects of paprika, onion powder, chili powder, salt, etc. But then I mentioned brown sugar. His eyes lit up, and he said “Brown sugar? 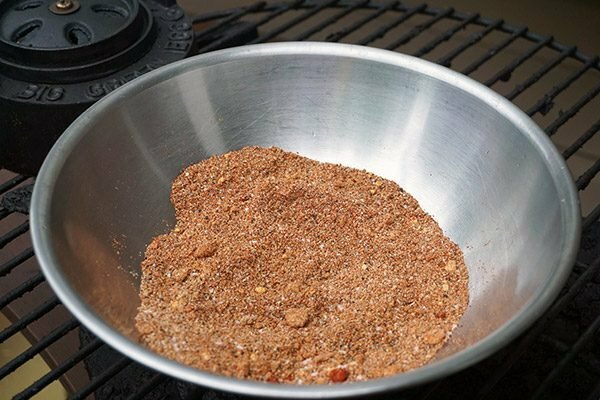 Interesting!” I’ve always included a bit of brown sugar in the rub for brisket. Perhaps that’s just the southern boy in me coming out? 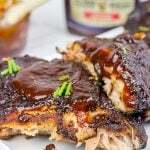 Either way, the hint of sweetness in the rub (it’s not too much at all) combines quite well with the smokey flavors. A good rub – check! Next up: Lump charcoal and wood chunks. The first thing I learned about smoking when Laura gave me the smoker was to use lump charcoal. Now I know the lump charcoal vs. briquettes debate is hotly contested (no pun intended!) in the world of grilling, but I prefer lump charcoal when it comes to smoking. Lump charcoal is charcoal in its purest form, and I’ve found that it allows me to control the smoker temperature quite easily. I also don’t need to refill it. One smoker full will last the entire day…and probably longer if I needed it! Similarly, I also use wood chunks on the smoker. Wood chunks are just that. Larger chunks of wood, and they end up smoldering rather than burning up quickly like wood chips. For smoking, you want that long smolder to keep a consistent amount of smoke going throughout the process. You can find wood chunks in a variety of different flavors, but my favorites are mesquite, hickory and apple wood. The different flavors do impart a slightly different taste, so it’s fun to mix it up a bit. 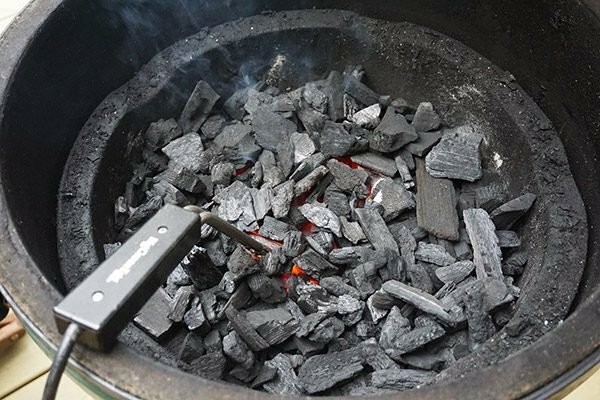 Lump charcoal and wood chunks – check! Next up: nothing. Nothing. Seriously. Once you get that smoker prepped and at a stable 225°-250°F, you get to sit back and do nothing. We spent the day doing yardwork and spraying Robbie with the garden hose (he loved that game!) while the smoker sat up there on the porch just doing it’s thing. I typically plan on about 1 hour to 1 hour, 15 minutes per pound when smoking a brisket. That means that brisket will be on the smoker for the better part of the day. Because of that, I do not recommend trying to smoke a brisket and serve it for dinner that night. I’ve tried that before, and dinner plans had to change when the brisket took a little longer that expected. (I just leave a probe-style thermometer in the brisket, and that’s my ‘timer’ to know when it’s done.) So learn from my mistakes and just plan to eat the brisket the next night…although a little bit of snacking is totally allowed when you slice up the brisket! So I just spent the better part of this post talking about the smoker, and we haven’t even gotten to the Smoked Brisket Tacos yet. Well, truthfully, the smoked brisket itself is the shining star of this recipe. The smoked brisket tacos come together quite easily once the brisket is done. I just chop the brisket into small pieces (~⅓ to ½ cup of chopped brisket per taco) and then reheat it in a dry skillet. Spread a bit of homemade guacamole on some flour tortillas, and you’ve got yourself a quintessential summer meal! My Dad still lives down in Texas, and we served him this same smoked brisket recipe last year when he came up to visit. He spent the rest of the trip trying to convince me to open a BBQ restaurant in his little town north of Austin. Tempting…but it gets really hot in Texas, and I think my blood has thickened a bit since we moved north! Plus, I don’t think Austin has a curling club yet. Have I convinced you to get out there and smoke a brisket this coming weekend? Click here to find a store near you that carries Certified Angus Beef ® brand beef. (You might want to call ahead just to make sure they have brisket in stock.) 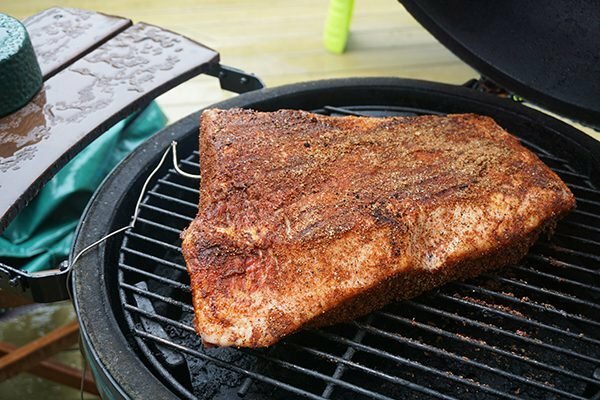 Grab a brisket, cover it with a good spice rub and then put it on the smoker. Next thing you know, you’ll have enough Smoked Brisket Tacos for days…that is unless your neighbors come poking around to see what smells so good in your backyard! Cheers, friends, and I hope you are enjoying grilling and smoking season as much as we are! Using a small bowl, combine the spices for the rub. Generously apply rub to all sides of brisket; let sit at room temperature for an hour or in refrigerator overnight. Occasionally check the temperature of the smoker to ensure it stays within 225°-250°F. When the internal temperature of the brisket reaches 165°F, remove the brisket and place in the disposable aluminum pan. Pour the stock into the pan and then wrap the pan (brisket and all) and place it back on the smoker. When the internal temperature of the brisket reaches ~190°, remove the brisket from the smoker. 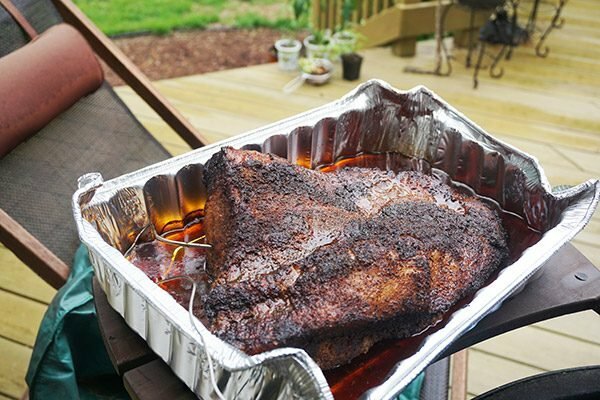 Leave the brisket in the aluminum pan and let it rest for at least 30 minutes before slicing. When slicing, I typically remove and discard most of the fat cap. Then I slice the meat itself into large slices. These can either be frozen or stored in the refrigerator. Then when making the tacos (or other recipe using smoked brisket) I chop several slices into small pieces and then reheat it in a dry skillet. Add all guacamole ingredients to a medium bowl. Using a fork, mash until well combined. Spread ~2 Tbsp of guacamole onto each of the flour tortillas. Spread chopped brisket evenly over tortillas and then top with chopped tomatoes and onions. 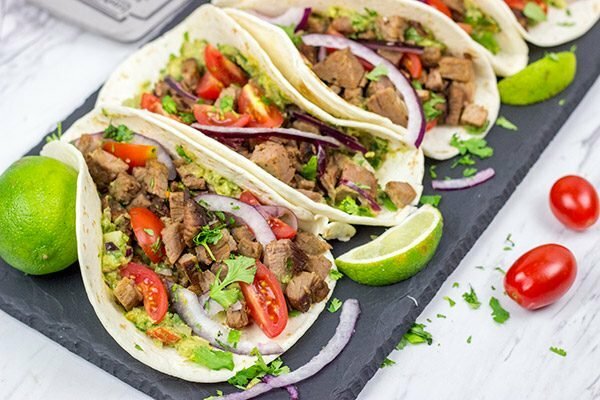 Sprinkle freshly chopped cilantro and squeeze a fresh lime over each taco before serving. 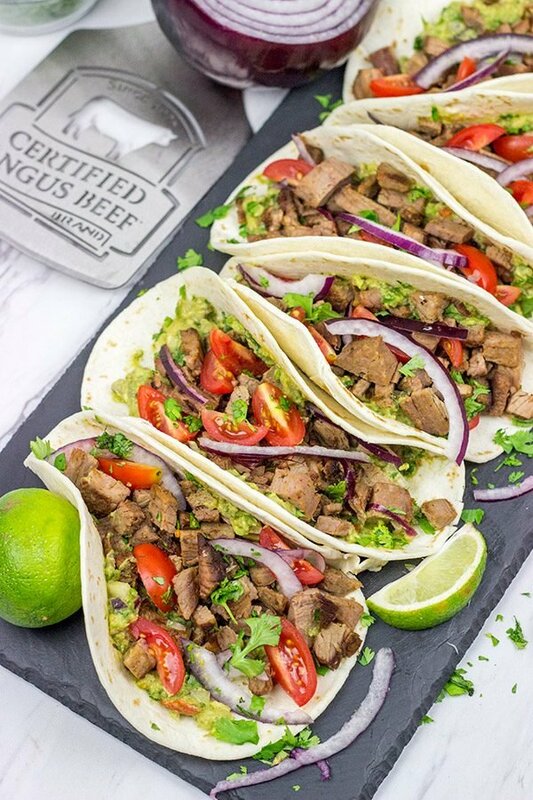 If you try out these brisket tacos, let me know…they’re one of our favorite summer meals! Done! See ya at 6ish? How about both? AM for setting up the smoker. PM for eating the brisket. 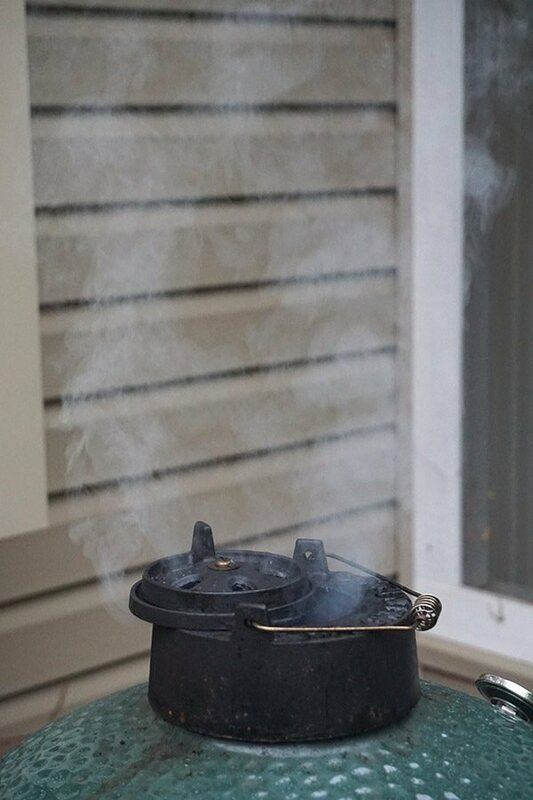 I haven’t gotten into smoking but my dad got a smoker a few years ago and for months that was all I heard about–next time I go up for a visit I’m totally going to have him smoke sweet potatoes for me. That sounds delicious! Hope you’re having a great week! I can almost smell that smoky brisket! Now I’m so hungry!! And no better way to enjoy it than in tacos! Perfect for 4th of July! Oh man, the smell of smoked brisket wafting through the backyard is seriously one of the best parts about summer! It takes a couple of hours before the smell really gets going, but I’ve been known to put my nose right down in the smoker to get a good whiff. 🙂 Thanks, Marissa! So cute how excited your dad got about your beef and I think he might have a point. I’d love to try your smoked brisket and OMG those tacos look heavenly. I like how you use your early mornings prepping your smoker, that’s true dedication 🙂 I could imaging that my husband might enjoy this as well – he loves his meat too. Have a great weekend ahead, David! Oh man, if only you could have seen him, Miriam! Now my Dad is a true Texan through and through…and he loves his beef. We stopped and got smoked brisket sandwiches at a BBQ joint near his place on Thanksgiving Day one year. True story! But it was a real honor for him to go back for seconds on my smoked brisket. 🙂 If you guys haven’t gotten into smoking, seriously give it a thought. If you like to grill, then smoking is a natural jump…and it’s SO much fun! And then you end up with things like smoked brisket tacos, and that’s just pretty awesome. Haha! Thanks so much, my friend, and I hope you have a great weekend ahead! Dude – even though you have protested before, I think your dad is onto something with his suggestion about that BBQ Joint… but I think you should do it in Atlanta – and guess what??? There IS a curling club here http://atlantacurlingclub.com/ 🙂 And… while y’all and Robbie might love the hose spraying game, he can have a HUGE spraying off at one of such fountains https://www.gwcca.org/park/ So – with that said, when are y’all moving??? Seriously, this is one gorgeous looking brisket – and enjoying it in tacos means brisket for days – right? That brisket looks fantastic. Now that I’ve moved from gas to charcoal, smoking a brisket is definitely on my “to do” list for this summer. Probably during my vacation when I’ll have plenty of time to spare. Yes! Once you go to charcoal grilling, it’s not a far leap from there to smoking. And smoking opens up a whole new world of possibilities! 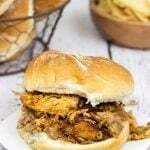 Brisket and pulled pork are my two go-to’s on the smoker, but I have a whole list of things I want to try before the winter comes back. (I shudder at the mere thought of winter coming back…) Let me know if you have any smoking questions, Frank! I’m usually up at 7am on a Saturday morning getting something ready to go into my slow cooker for the day so we can go out and it’ll be ready for when we come back. Or I’ll be baking some bread. But, if I had a smoker I’d definitely be doing these! So perfect for summer David! Oh, you should totally get into smoking, Neil! Laura got me a smoker a number of years back for my birthday, and it’s definitely the gift that keeps on giving. 🙂 Plus, she gets to be the official taste tester of everything on the smoker, so she’s happy, too. Haha! Hope you had a great weekend, my friend! Haha! I get the difficulty in having a smoker in an apartment. But now you have something to look forward to whenever you move out into a house…that and mowing the lawn. 🙂 And the thought of Robbie prepping the smoker while I sleep in is hilarious. The problem is the smell of delicious smoke wafting up from the back porch would have me out of bed in no time flat! Thanks, Ben! Rod is the smoker in our household. He usually smokes pork, but I need him to start smoking beef brisket! I love these tacos and I really love have leftovers for another night! Both my brother and sister have a smoker. They both love making all kinds of food in their smokers. These smoked brisket tacos look like something that I would love. Mouthwatering. Thank you so much for this post, David. I was gifted a smoker years ago and I’ve been too intimidated to use it. Whelp, not for long! I’ve bookmarked this page so I can make smoked brisket this weekend! Gah, I’m so nervous yet excited, thanks for the tips! Oh my gosh! Go get that smoker out of the box. Or out of the basement. Or out of wherever it’s hiding. I know smokers might sound intimidating, but they aren’t bad at all…and it opens up a whole new world of awesome possibilities. The hardest part is learning to manage the temperature. For me, the temperature swings a bit at the start, so I keep a close eye on it and adjust the air vents as needed. But once it stabilizes, that sucker can just go all day with barely a peek! And in the end, I have a big pile of smoked brisket. So good!! Feel free to shoot me an email if you have questions, my friend. I’m happy to help! As I think I’ve mentioned I just got a charcoal grill that can be set up for smoking. A nice brisket is definitely on the to-do list, and now I have my recipe, thanks! You did mention that, Frank…and I’m cheering you on to learn more about the smoking side of grilling. It opens up a whole new world in terms of recipes and ideas! I’m happy to help if you have any questions, too! OMG David, you’re making me want to run out and get a smoker. It’s probably the only cooking “appliance” I don’t already own. This brisket looks AMAZING! I love brisket, but have only cooked a half brisket. This has me totally rethinking my 4th of July spread! Thanks for the recipe! Ah yes, I did indeed make a critical error there. Tacos are the best part of the WHOLE year. I mean, they did commandeer Tuesdays after all. 🙂 Smoked oil?! Now I’m intrigued. I’ve also heard about some other cool ideas like smoked whipped cream (you should try that…cold smoked!) and smoked mac and cheese. But smoked brisket is a classic that you just can’t beat! Sounds like you’re doing well down there in the city! Well, the smoked whipped cream was served with a grilled strawberry shortcake…so it made sense. But I like your idea of a smoked crema. I’m on it!